Midfielder Joey Barton felt a 3-0 scoreline was harsh on the Clarets at Hull City on Boxing Day. Burnley slipped to a third defeat in five games after second half goals from Jake Livermore, Abel Hernandez and Sam Clucas. And Barton felt the opening goal from fellow one-cap England international Livermore was the turning point after a tight first half. He said: “We’re just disappointed really. “There wasn’t much in the game and in the first half, I think, if anything, we were slightly the better side. “It was always going to be a case of whoever got that first goal would have massive impetus, and credit to their lad. “We’ve not stopped the cross coming in and he’s got off the back of me. “I thought I had the ball initially, and the wind has taken it slightly, but it’s one hell of a strike so take nothing away from him. 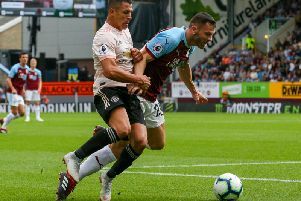 Uruguay striker Hernandez added a second after Andre Gray – a summer transfer target for Hull – squandered Burnley’s best opportunity, and Clucas wrapped things up in injury time from a Robert Snodgrass pull back. Ahead of yesterday’s home clash with Bristol City, Barton knows the Clarets’ away form must improve to stay among the promotion chasers: “We obviously weren’t the best we could be today, but for long periods of the game until they scored I thought we were the better side. “Those are the fine margins at this level and it is back to the drawing board. “We had a good result against Charlton after a little bit of a disappointing spell. “It’s never good to lose to teams who are going to be in and around the play-offs.